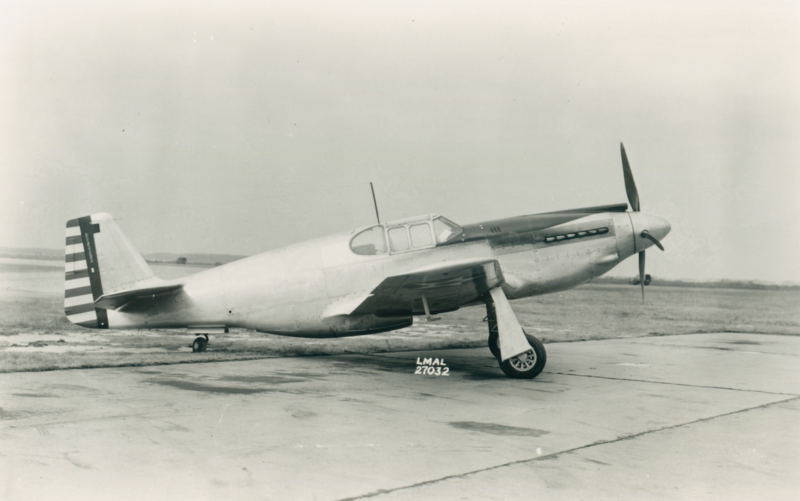 23 April 1941: At North American Aviation’s Inglewood, California factory, test pilot Louis Sanford Wait takes the very first production Mustang Mk.I, AG345, (c/n 73-3098) for its first flight. 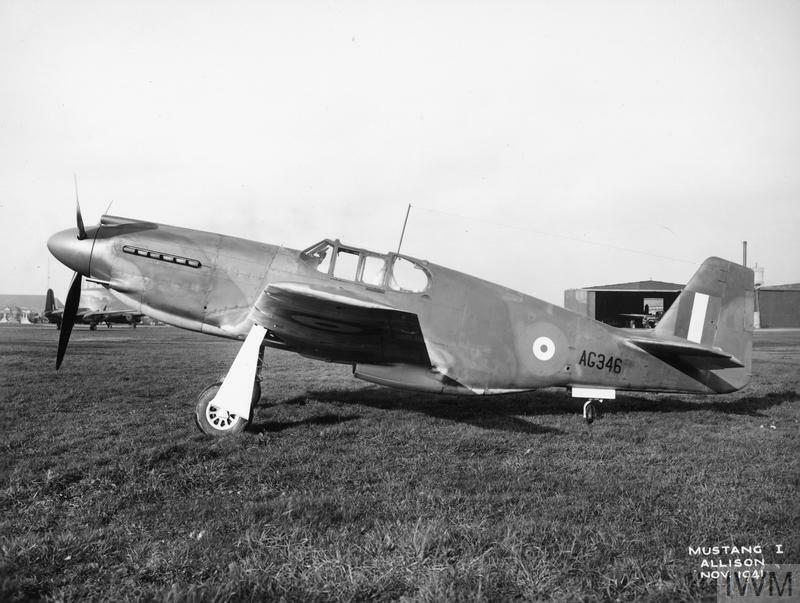 The Royal Air Force had contracted with NAA to design and build a new fighter with a 1,200 horsepower Allison V-1710 supercharged 12-cylinder engine. The first order from the British Purchasing Commission was for 320 airplanes, and a second order for another 300 soon followed. 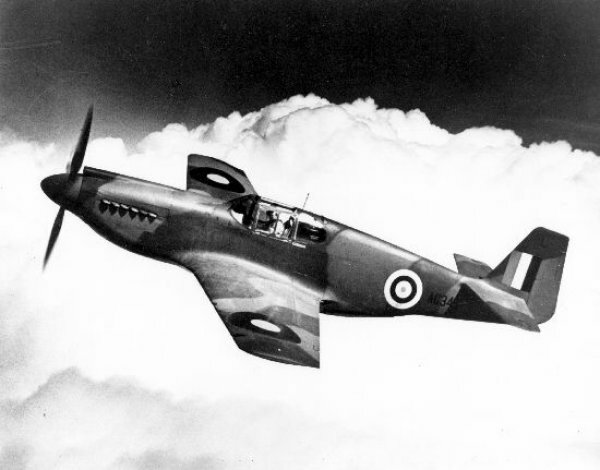 The Mustang Mk.I was powered by a liquid-cooled, supercharged 1,710.597-cubic-inch-displacement (28.032 liter) Allison Engineering Company V-1710-F3R (V-1710-39) single overhead cam (SOHC) 60° V-12 engine with a compression ratio of 6.65:1. The -F3R had a Maximum Continuous Power rating of 880 horsepower at 2,600 r.p.m. at Sea level, and 1,000 horsepower at 11,000 feet (3,353 meters). It was rated at 1,150 horsepower at 3,000 r.p.m. for Take Off and Military Power. 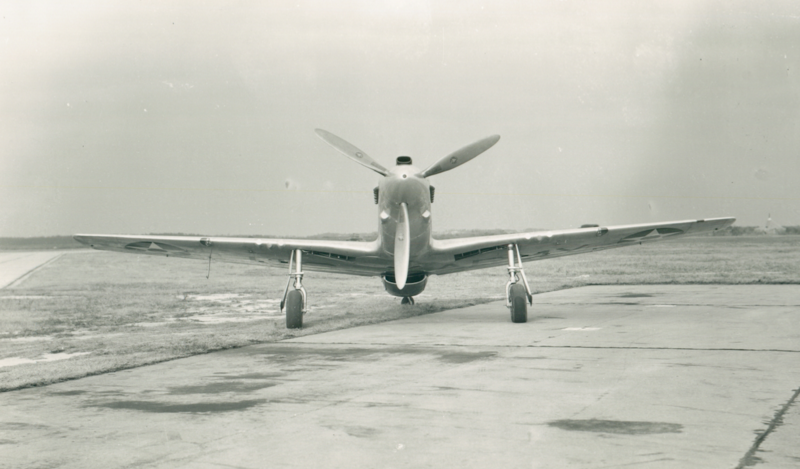 The Allison V-12 drove a 10 foot, 9 inch (3.277 meter) diameter, three-bladed Curtiss Electric constant-speed propeller through a 2.00:1 gear reduction. 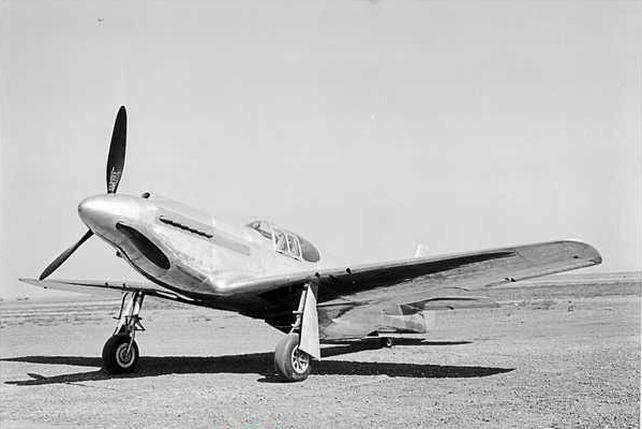 The V-1710-F3R was 7 feet, 4.38 inches (2.245 meters) long, 3 feet, 0.54 inches (0.928 meters) high, and 2 feet, 5.29 inches (0.734 meters) wide. It weighed 1,310 pounds (594 kilograms). 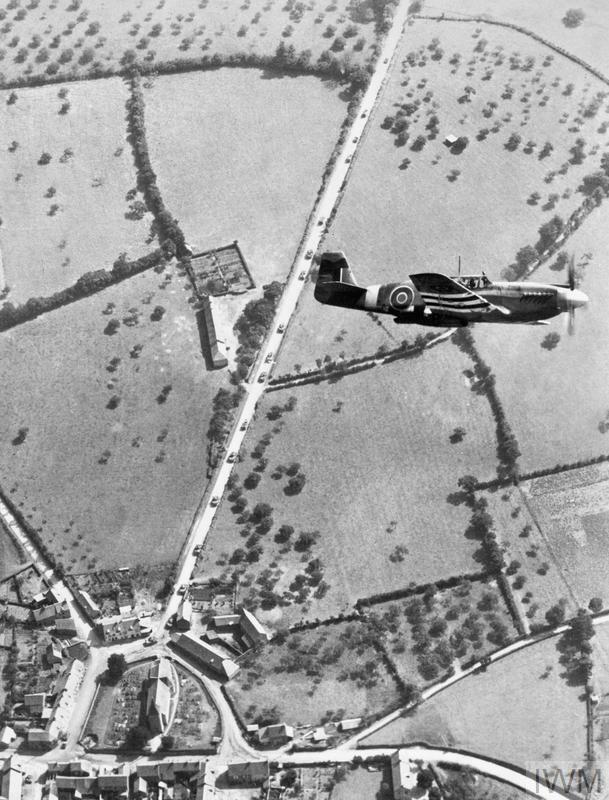 The Mustang Mk.I had a cruise speed of 311 miles per hour (500.5 kilometers per hour) at 75% power, and a maximum speed of 384 miles per hour (618 kilometers per hour) at 19,000 feet (5,791 meters). The airplane could reach 20,000 feet (6,096 meters) in 8.80 minutes. The service ceiling was 32,000 feet (9,754 meters) and its range was 640 miles (1,030 kilometers). 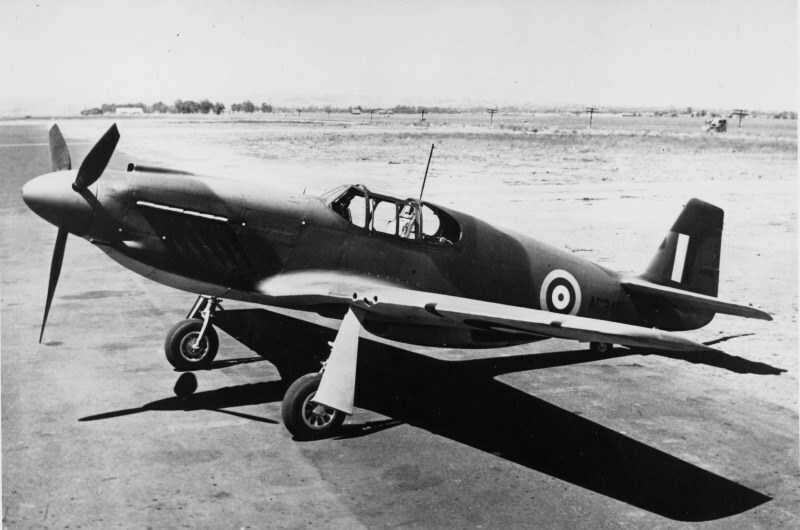 The Mk.I was equipped with four Browning AN-M2 .50-caliber machine guns, with one in each wing and two mounted in the nose under the engine. 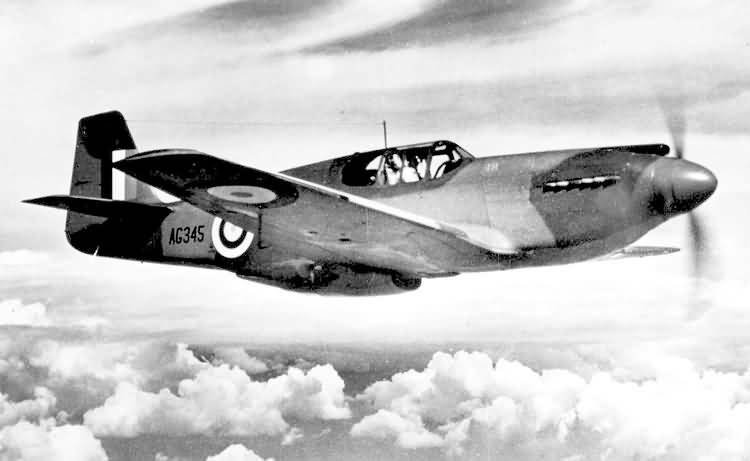 Four Browning .303 Mk.II machine guns were also installed, with two in each wing. 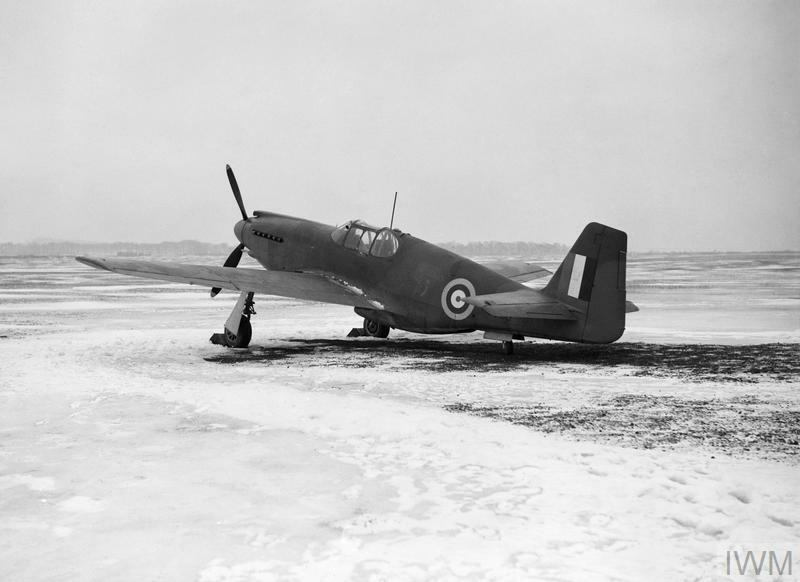 The Mk.I was 30 m.p.h. 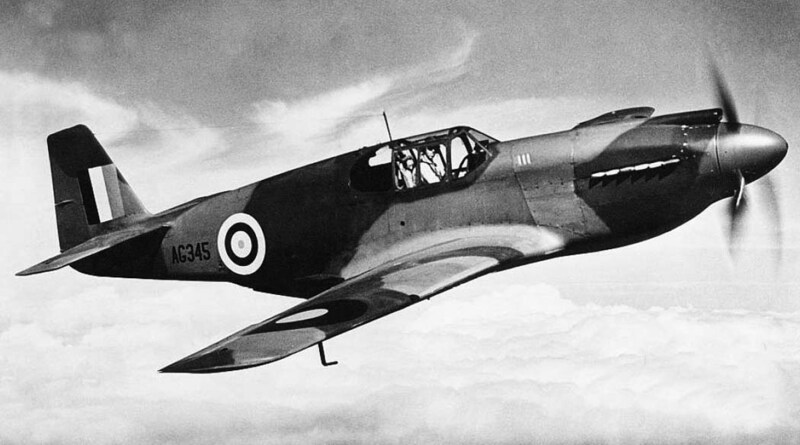 (48 kilometers per hour) faster than its contemporary, the Curtiss P-40 Warhawk, though both used the same engine. 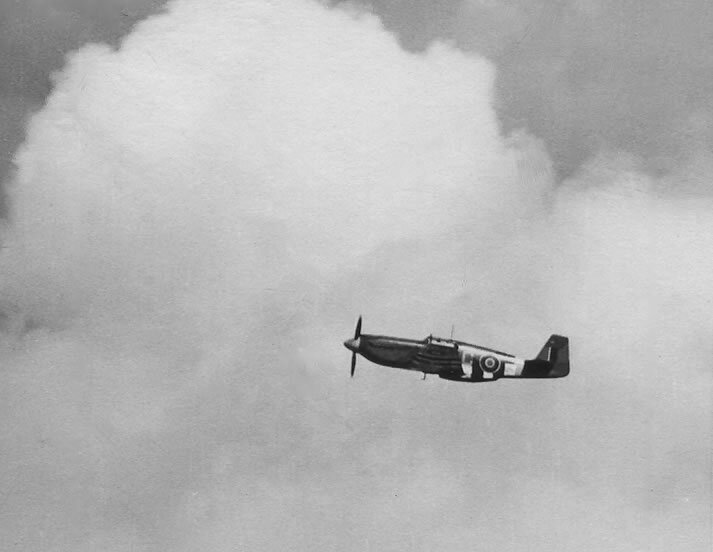 Below 15,000 feet (4,572 meters), the Mustang was also 30–35 m.p.h (48–56 kilometers per hour) faster than a Supermarine Spitfire, which had the more powerful Roll-Royce Merlin V-12. 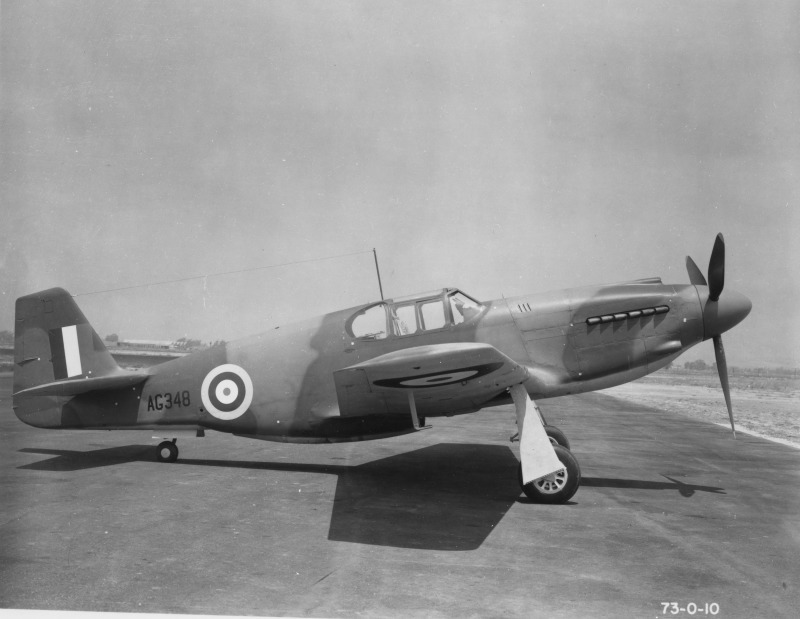 Two Mustang Mk.Is, AG348 and AG354, were taken from the first RAF production order and sent to Wright Field for testing by the U.S. Army Air Force. 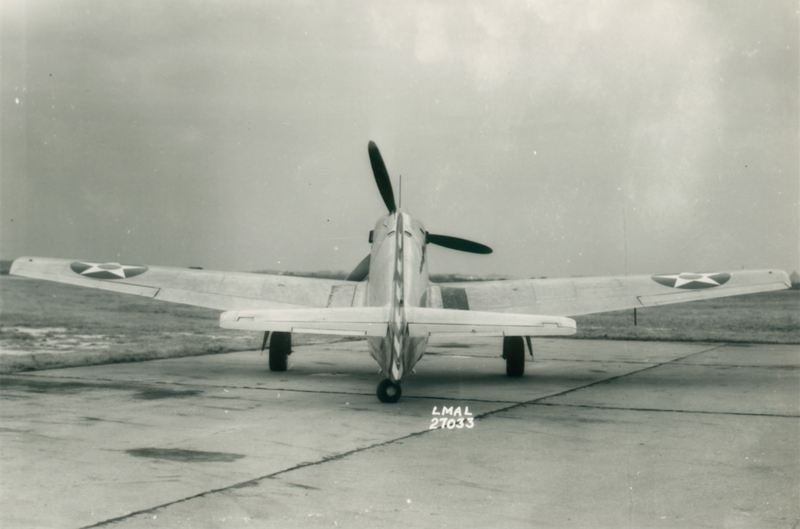 These airplanes, assigned serial numbers 41-038 and 41-039, were designated XP-51. 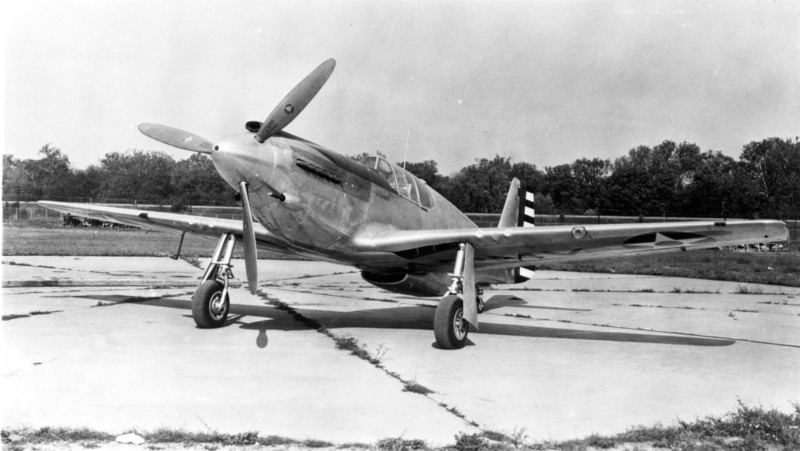 They would be developed into the legendary P-51 Mustang. 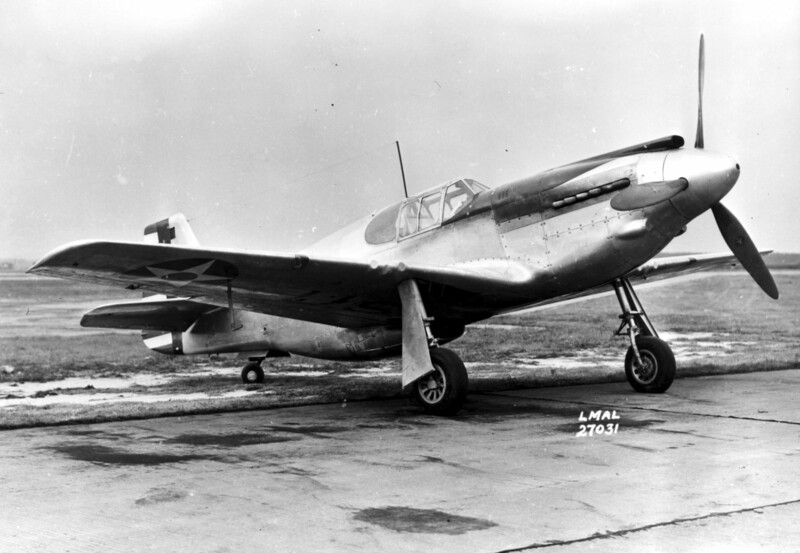 In production from 1941 to 1945, a total of 16,766 Mustangs of all variants were built. Louis Sanford Wait was born 28 June 1908 at Superior, Nebraska. He was the first of two children of Dr. James Enos Wait, a dentist, and Alice Caroline Harrington Wait. Wait enlisted in the Air Corps, United States Army, as an aviation cadet, in 1929. He trained as a pilot at March Field, near Riverside, California, and at Kelly Field, Bexar, Texas. Wait graduated 27 June 1930 and received his pilot’s wings and a commission as a second lieutenant, Air Corps Reserve. 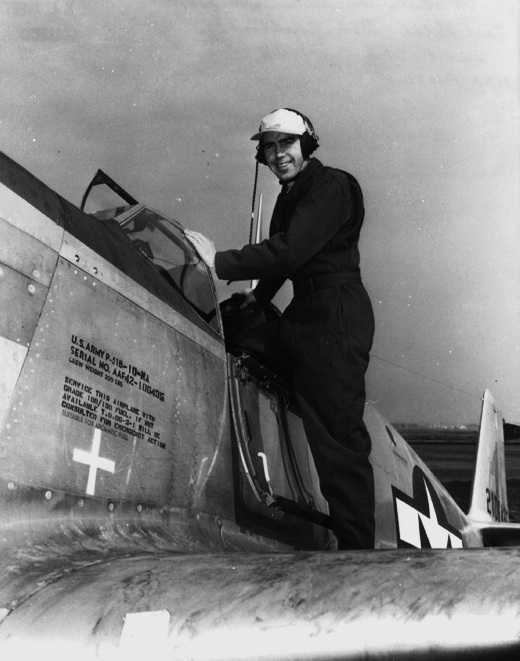 (O274973) Lieutenant Wait trained as an attack pilot and was assigned to Fort Crockett, Galveston, Texas. 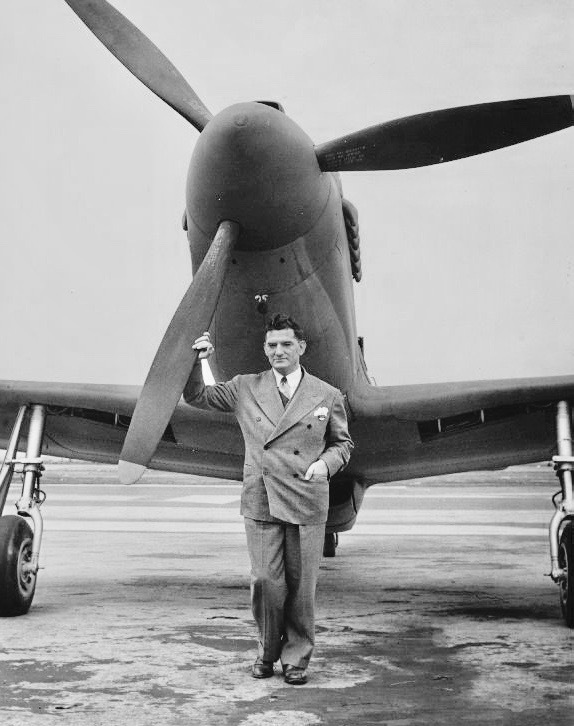 From 1932 to 1935, Wait, having been released from active duty, was employed as a test pilot for the Boeing Airplane Company, Seattle, Washington. 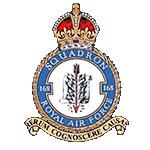 By 1937, Lieutenant Wait was assigned to Headquarters Squadron, 2nd Bombardment Group at Langley Field, Virginia, under the command of Brigadier General Robert Olds. While on 18 days leave, on 3 December 1937, Second Lieutenant Wait married Mrs. Elsie O. Callow (née Elsie Oliver) at Amityville, New York. Wait married Mrs. Mary Elizabeth Croxen (née Mary Elizabeth Musser), 2 November 1944, in Los Angeles, California. 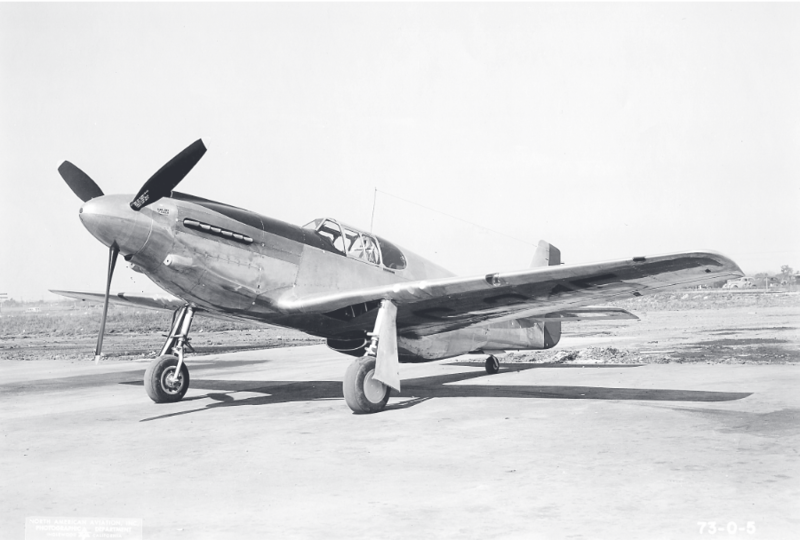 In August 1946, Louis Wait entered a P-51C Mustang, NX28388, in the Bendix Trophy Race. 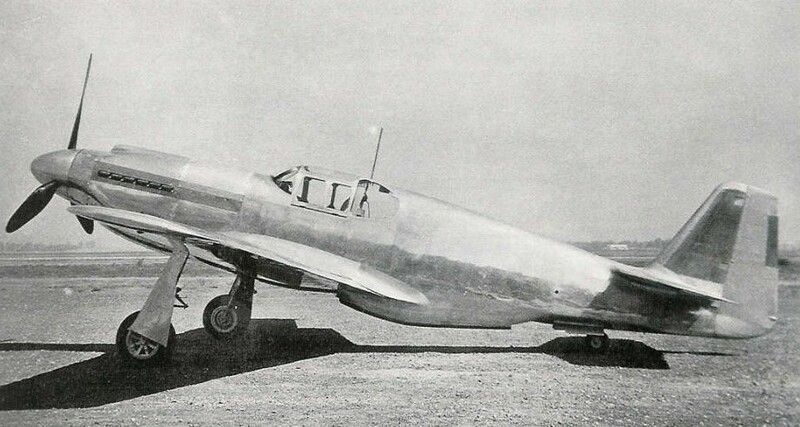 The airplane had been purchased by Jackie Cochran. She flew it in the race and finished in second place behind Paul Mantz. In 1951, Wait was appointed general administrator of a new North American Aviation plant at the Fresno Air Terminal, Fresno, California. 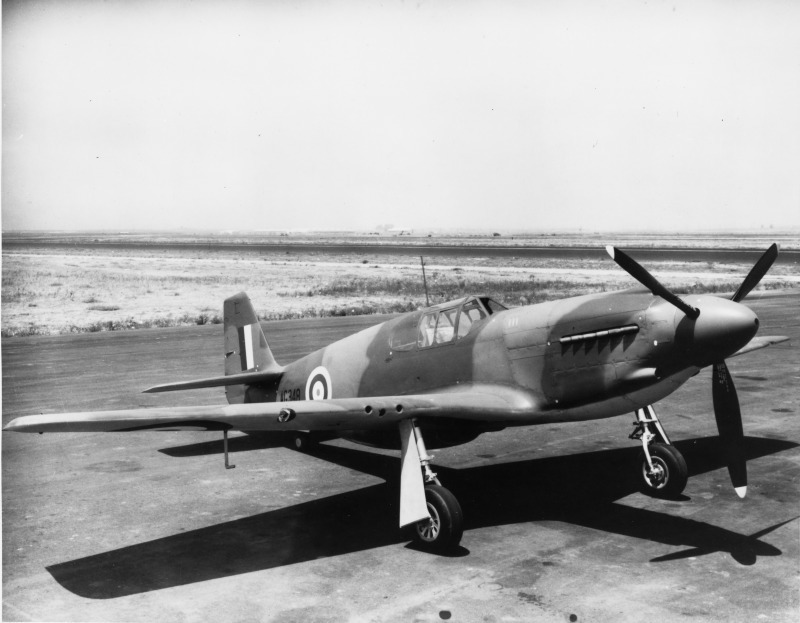 The plant, which employed about 400 people, manufactured and repaired parts for the T-6/SNJ Texan flight trainers, and performed modifications to F-86 Sabre jet fighters. Louis Sanford Wait died 3 July 1963, at the age of 55 years. 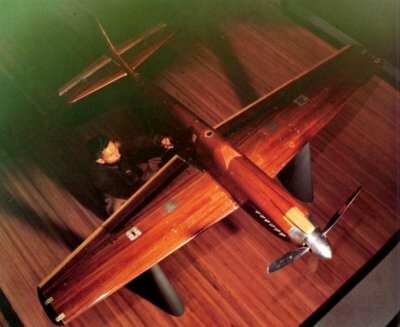 28 June 1940: A ¼–scale mahogany model of the North American Aviation NA-73X, prototype of the Royal Air Force Mustang Mk.1, was tested in the Ten-Foot Wind Tunnel at the Guggenheim Aeronautical Laboratory of the California Institute of Technology (GALCIT) in Pasadena, California, from 28 June to 26 July 1940. The Ten-Foot Tunnel was funded by a $300,000 grant from the Daniel Guggenheim Foundation. Construction of the Laboratory began in 1927 and the wind tunnel became operational in November 1929. A 15 foot (4.572 meter) diameter fan was capable of producing air speeds up to 200 miles per hour (322 kilometers per hour). 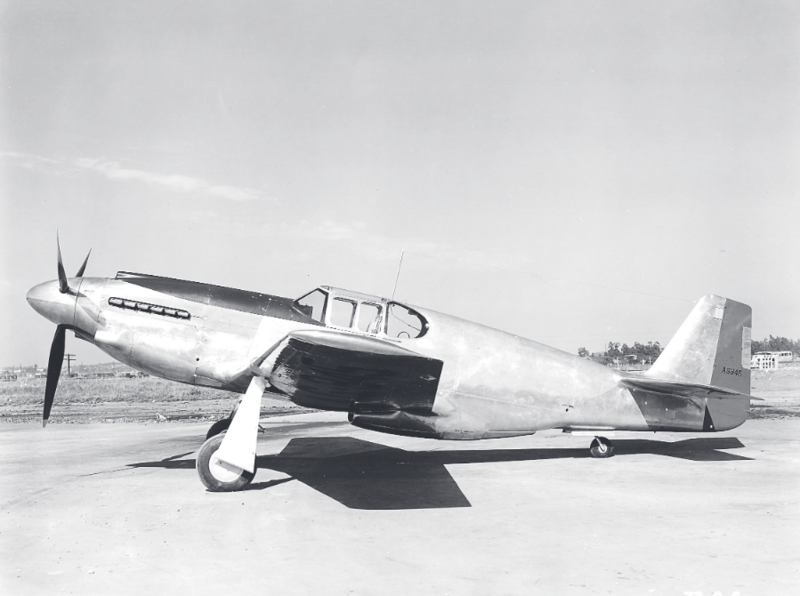 The first complete scale model airplane to be tested was the Northrop Alpha. Airships, airplanes, and structures (bridges, buildings) were tested in the tunnel. 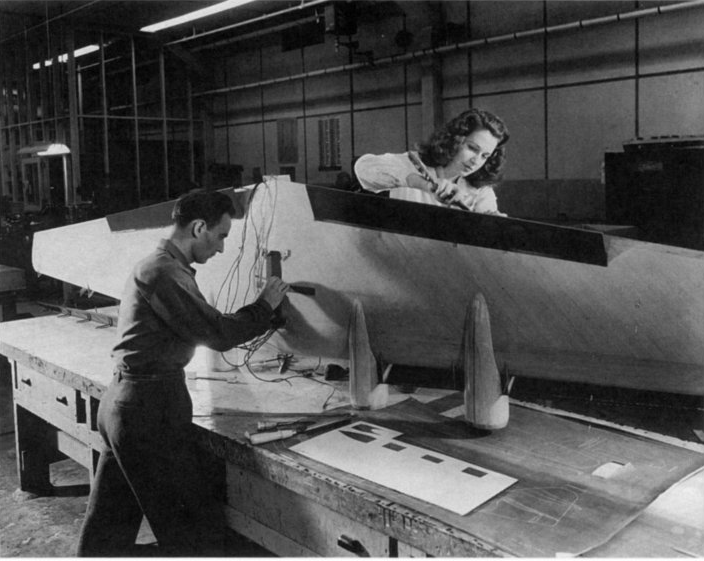 According to Caltech, the Douglas Aircraft Company used the facility more than any other manufacturer. The wind tunnel’s test equipment was damaged by the Whittier Narrows Earthquake. It was closed in 1997 to be replaced by a new facility.